As you might be aware, we have joined up with Fraunhofer to include their MMPlayer app standard on Titus–what a difference a professional decoder, for both analog, DRM(+), and DAB(+), makes! MMPlayer is full featured even including reliable one way file downloads with DRM. We are attempting also to license HD to include on the app for North America, making a truly worldwide receiver. Some deficiencies in our version of Android have caused issues as well as MMPlayer. All of which have caused delays leading to some serious business decisions – as you can imagine. You are correct that broadcasters have made large orders that will be fulfilled first. There are units in the field testing and such and continuing resolution of the software issues. One of the issues that folks seem to have a hard time understanding is that we can not just build a few hundred or even thousands of units. Our minimum run is 10,000pcs! To do that everything has to be 100% – including the software. We simply will not ship units that are not 100%. Titus works, MMPlayer works – its that last 5% that takes the most time to resolve. These facts preclude any incremental production attempts. All that being said, we are very hopeful that the first production run is ready by last quarter of this year. Thank you for the update, Mike! This entry was posted in Digital Modes, DRM, New Products, News, Radios, Shortwave Radio and tagged Digital Radio Mondiale, DRM, PantronX Titus II, SDR on June 4, 2018 by Thomas. Participants in the four DRM events organised at IBC by Gospell, Thomson Broadcast, Nautel and Ampegon between 15th-17th of September have had an insight into a wide range of DRM activities, from big projects in Morocco (Thomson Broadcast), India and Hungary (Nautel), to the progress of DRM in South Africa. And DRM used not just for broadcasting but for other vital activities was demonstrated by Rfmondial involved in a wide-ranging application for the US Coast Guard. One constant for all events, each unique and so different from the other, was the positive messages about DRM in both AM and VHF and the increasing availability of new receiver and receiver solutions, many always on display. The first event on Friday the 15th (Gospell) saw the launch of GR-227 the multi-standard (DRM/DAB/DAB+) car adaptor that is compatible with any car stereo with USB port and able to work with Android Smart Tune App. As the manufacturer explained, this after-market solution can be a significant development allowing digital reception in cars initially fitted with analogue receivers. Of equal major interest was also the Titus II multi-standard digital radio receiver produced by Titus SDR, a division of PantronX. 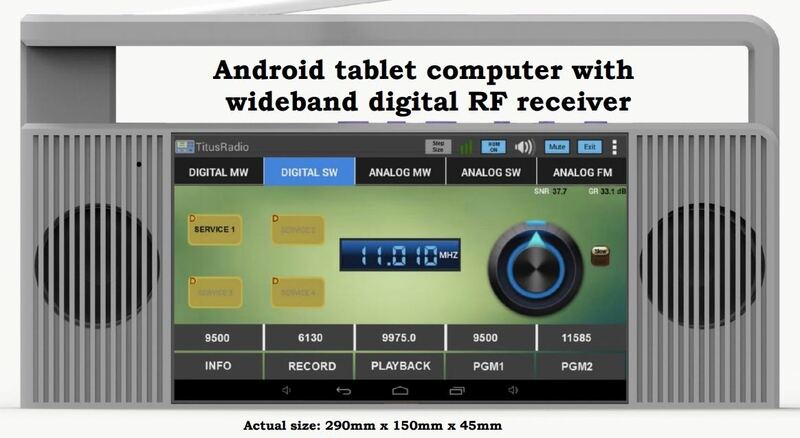 The consumer software-defined radio digital receiver platform, which is the result of collaboration between Titus SDR/Patron X, Jasmin-Infotech, TWR, and Fraunhofer IIS, supports multi-standard radio reception, including DRM, DAB and DAB+ and core data applications. The representatives of PantronX and TWR received lots of questions about this receiver system based on a custom Android tablet platform, featuring multipoint touch, WiFi/Bluetooth and stereo sound. Other receiver possibilities: the tablet solution presented by Fraunhofer IIS, the Indian receiver Avion, and a new concept DRM receiver produced in South Africa all enforced the idea that the excellent work done by transmitter companies like Thomson Broadcast, Nautel and Ampegon in providing a digital transmitter infrastructure in many parts of the world can link now with the innovative receiver solutions. The Thomson event came alive with the presentation about the huge project in Morocco and the Nautel event attracted lots of guests already familiar with the big projects of this established transmitter manufacturer recently in India and now in Hungary. This entry was posted in AM, Articles, DRM, FM, News, Shortwave Radio and tagged Digital Radio Mondial, DRM, Gospell GR-216, Gospell GR-227, NASB, National Association of Shortwave Broadcasters, PantronX Titus II on September 25, 2017 by Thomas. Titus SDR, a division of PantronX, says the Titus II multi-standard digital radio receiver is ready for production. This entry was posted in New Products, News, Radios, Shortwave Radio, Software Defined Radio and tagged PantronX Titus II, Radio World, Richard Langley, SDR, Software Defined Radio on September 19, 2017 by Thomas. “We are first fulfilling large orders from international broadcasters. Individual orders most likely are late fall. If you preordered someone will contact you when the order comes up. Sorry for the delays but demand has been almost overwhelming. Thanks fo sharing this update with us, Ed! This entry was posted in DRM, New Products, News, Radios, Shortwave Radio, Software Defined Radio and tagged Digital Radio Mondiale, DRM receiver, PantronX Titus II, SDR, Software Defined Radio on June 18, 2017 by Thomas. Many thanks for the tip, Richard! This entry was posted in Digital Modes, DRM, New Products, News, Radios, Shortwave Radio and tagged AWR Wavescan, Digital Radio Mondiale, DRM receiver, PantronX Titus II, Richard Langley on April 11, 2017 by Thomas.